Sea kayaking and rock climbing! Based just a few minutes away from the capital of Crete, enjoy-crete.com provide friendly and experienced guiding, tuition and taster sessions in all aspects of mountaineering. From one day rock climbing and abseiling sessions to comprehensive courses aimed at providing you with the knowledge and skills to look after yourself in the mountains. Crete has a huge variety of walking and climbing on offer as you can easily seen on climbincrete.com. Whether you choose, you will be guaranteed a unique and memorable experience. 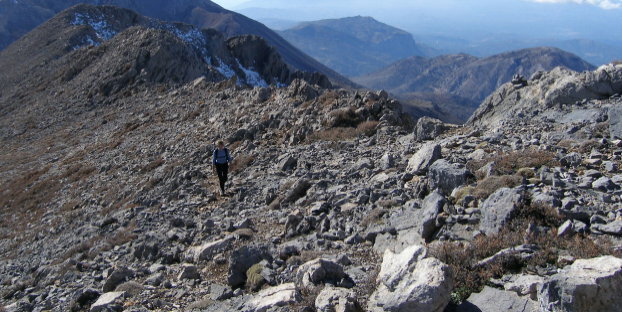 The idea of a mountain race in Crete, with high international standards, was first born in June 2008 on Mt Olympus. Our love for the mountain Psiloritis where Zeus brought up, the promotion of the natural beauty of the area finally transformed the idea into practice .Having the support of the people who love the island and enjoy running on the mountains, we organize this event which is called the "Psiloritis Race" (PR). The event is organized with the kind support of the prefecture of Rethymno. Ski in Crete? Of course! Do believe me, mountains and ski resorts in mainland Greece can feel much jealous of this mountain! So for someone wishing to go skiing in Crete there are two choices, as the ski resort is actually not working: to carry the skis on their back and after some quite tiresome walking to ski down a little bit or to put the skins under the skis and start touring around. We are going to deal with the latter.